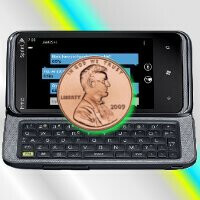 Granted that we have new devices like the HTC Trophy and HD7S on the horizon with Verizon and AT&T respectively, but when you think about it more, neither are actually new Windows Phone 7 handsets – though, one can argue that the HTC Arrive still retains the crown as the newest member of the WP7 family in the US. It’s not like we’ve seen it before, but Amazon is making it very irresistible to not take notice because they’re now selling the Arrive for a mere penny with a contract. Yes, that’s a single penny that we know you’ll be able to find somewhere in the pockets of space outlining your living room couch. Surprisingly enough, the offer is actually available to both new and existing customers with qualified upgrades. Microsoft is expected to show off some exciting stuff on the 24th of this month, but if you really want to get settled with the new platform right now, it wouldn’t hurt to grab this sick deal through Amazon. Nokia really should write out thank-you notes to HTC. Their commitment to putting out W7 devices will really make that transition easy for Nokia, as Microsoft has had a willing partner to iron out the early problems with a brand new OS. While Droid has made HTC a household name, an earlier posting from another blogger here on Phone Arena pointed out that HTC got their foot in the door of handsets with Windows Mobile, and the company has shown true dedication to Microsoft, even after soft sales of W7 devices. Nokia and Microsoft can only benefit from that, and hopefully so will the consumer. It is $99 for existing customers. 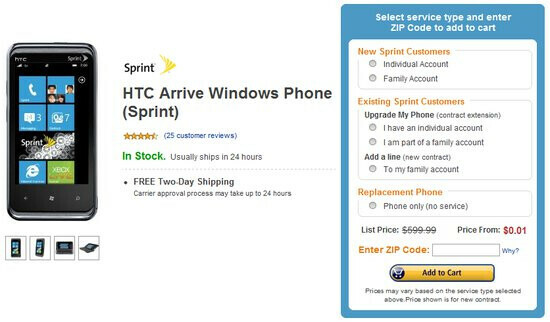 Even customers like myself that are eligible for an upgrade it is $99. I would definately get the phone if I could get if for 1 penny. If anyone knows of a way to do that please post it here.